Contest: Win At Eternity’s Gate on Blu-ray and Digital! Julian Schnabel’s At Eternity’s Gate is a journey inside the world and mind of a person who, despite skepticism, ridicule, and illness, created some of the world’s most beloved and stunning works of art. This is not a forensic biography, but rather scenes based on Vincent van Gogh’s letters, common agreement about events in his life that present as facts, hearsay, and moments that are just plain invented. 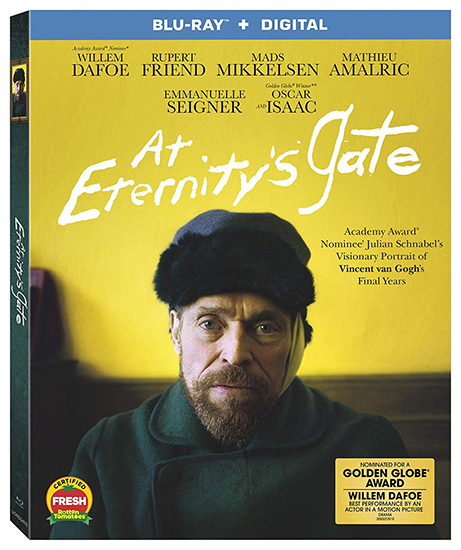 At Eternity’s Gate releases on Blu-ray, DVD, and Digital on February 12, and we have one copy of the Blu-ray to give away to a lucky winner! You have from now through midnight Eastern time on the night of Monday, February 4, 2019, to get your entries in. Take a look at the form below to see all the ways you can enter.